Slip-on convenience meets all-weather versatility in these rugged 10-inch Wellington boots. A waterproof-breathable membrane works with the sweat-wicking liner to keep your feet warm and dry in all weather. A steel toe adds critical impact resistance, while a reinforced shaft stands up to daily wear on the farm. The durable rubber tread sheds mud and holds firm on slippery ground. Too small, I am a size 8 on my right foot and an 8.5 on my left. I bought 8.5. They rub the back of my heals and are quite narrow, could hardly get them on with thin socks, can not go up a size because my toes do not even touch the front of the boot, bummed as they looked like they would be tough for working outside. It would be nice if you could order in wide widths. Thank you for your feedback and suggestion. Please feel free to contact us at 1-800-833-3118 if we can assist you further. Should have listened to the other reviews! I wear a 6 so I ordered that size. I found this boot to be accurate in that respect (photo of this boot compared to a size 6 Blundstone posted below). I am a relatively small person (height: 5’2”, weight 125 lbs with a small bone structure). This boot was beyond narrow. I could not even get my hand it in never mind my foot. 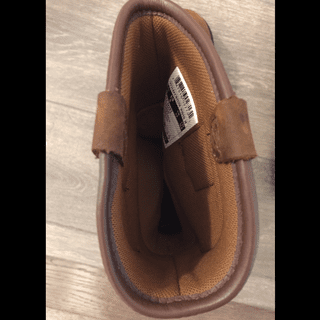 As shown in the picture of this boot with the Blundstone its side was almost completely compressed. I tried to stretch it out a bit with my hand but I quickly realized the heel is also incredibly small (see photos of this boot and my Blundstone for comparison). There was absolutely no way my foot was going to make it beyond the calf part and into the shoe part or even into the heel. Too bad because they are very nice looking boots otherwise. I can’t speak to any other aspects (rain proof, warmth, etc.) as I never actually got my foot in the boot. Inside of this boot showing the narrow calf and the small heel space. We appreciate your input and are sorry to hear of this experience. Please contact us at 1 800 833 3118 if you need any assistance. I love my boots! They are so much nicer than my last pair. The quality is awesome! I’m rough on boots and so far this pair is proving their worth. We are known for the durability of our apparel and we stand behind all of our products. Please contact us if you experience any issues with any of our products. You can reach us by phone at 800-833-3118 Monday-Friday from 8am-9pm EST and Saturdays from 9am-5pm EST, by Live Chat Monday-Friday 9am-12am or Saturday & Sunday 9am-9pm EST or anytime by email at just_ask_us@carhartt.com. I’ve tried really hard to love these boots. They look good and didn’t seem to uncomfortable the first time I wore them (approx. 30min mostly standing. I figured I just had to break them in a bit. The next few times I wore them for approximately the same about of time they just seemed to get more uncomfortable. I then walked in them for about 15min and now the heel digs into my foot really badly. It also seems like the more I wear them the more the steel in the toe seems uncomfortable. I’ve never been able to feel the steel toe dig into my foot in any other safety boots. Maybe I just got a bad pair of boot ????? I’m not sure. I just gave up on them and bought a different brand of boot after trying to break these in sporadically over more than a year. We appreciate your input and are sorry to hear that these boots did not meet your expectations. I saw these boots online and was really excited about them! I had read the reviews and they had said to size up, normally being a 6-6.5 I ordered a 7. The boots came and they looked great exactly how they were pictured, but the 7 was way too small a boot to be functional for me. It was narrow, and far too short, and if I had put a sock on I wouldn’t have been able to move my toes at all. So I went to my local carhartt store to exchange for a 7.5 or an 8, and both of these were too big for my feet, but still very narrow. I don’t consider my feet wide so this confused me. I ended up just returning them to my local carhartt store. They were attractive and seemed very functional, but I unfortunately couldn’t find the right fit to make them worth it! Love all my other carhartt gear though! Just purchasing work boots somewhere else. I bought these over a year ago and they are still holding up! There is some wear on the piping around the top but that's normal. I bought these as an extra pair of fall/snow boots so could wear them through the mud and snow/sleet and not ruin a nice pair. They are warm and keep my feet very dry! It does take a little bit of time to break them in but they will never overstretch. I plan on getting another pair soon. At first I gave the non-safety toe version of this boot an excellent review, but after the last week, I am changing my mind. With a bit of snow and ice on the ground, these boots are dangerous. The soles get very hard, trap snow, and as a result, they become extremely slippery on wood, concrete, plastic, and steel surfaces. I’ve had quite a few close calls where I’ve come close to falling. I spend two to three hours outside working with horses, and I’m very physically fit. I’m going back to my good old Canadian made boots that aren’t dangerous in winter. I wear a size 8.5 and my foot is narrow and these fit me perfectly. Stylish, easy to take on and off and warm! I wear them everyday while working with our GSP"s and in our yard. I wear them with my Carhartt Utility leggings. Love them! Absolutely love these boots, serves it’s purpose. These shoes/boots are the best thing I have ever spent my money on!! I work with racehorses and I've been looking for something like this for the longest time!!! Water proof, protects my feet when I get stepped on, and I have Lymphedema (chronic swelling) in one leg and the half-calf length makes it so much easier to slip them on and off (and fit) while avoiding the worse of the swelling in my calf/knee area. LOVE them! They also look great, are light weight, and keep them clean and they are the perfect rain boot to wear out in public :) - However, they run small!!!!!! My normal foot size is a size 6 and I needed to return them and get an 8 and a half!!! That's my only dislike and frustration with them, but the help from customer service has been unbelievable (in a great way)! I work offshore on a boat, 12 hour shifts a day. These boots are super comfortable. Not sure how long they will last with salt water around but we'll see. I wear wides but since they didn't have that and I know carhart is a good company I decided to order them and try them out. They are a bit too tight on the ankles and gotta push them in a bit to wear but they're leather, they'll expand. If they ran it in wide I would be a returning customer guaranteed. You bad. These boots take a few days to break in, but all boots do. Once you do wow what a boot. They look great with jeans, keep your feet warm and dry and are also a nice look! You don't even need to spray any kind of water resistant spray on it. I wear these everyday to work and they are very comfortable. Best boot I've tried on. No need to break in. Would recommend 100 times over. Great functionality and stylish but not work safe approved in Canada so don't buy if required by your company. I'm a welder in northern Canada. I just opened these and put them on. For a laceless boot they slid on surprisingly easily and slide off with ease (such a bonus! Can't count how many times I've been stuck in my riding boots). The fit is perfect, and I don't anticipate the break-in period will involve any bandaids or blister pads. Only time will tell how much the leather will relax, but for now they feel sturdy yet comfortable enough to be my everyday work boot. Plus they look great! I can now say I wear Carhartt head to toe on the job site. I've looked everywhere for a ladies pull on and had a lot of disappointment until now. Thanks Carhartt for taking care of us girls! I purchased these boots last fall for work, but I wear them every where! I received so many compliments on them, most people didn't even realize they are work boots until they looked more closely. They are comfortable and durable and well priced. I seriously recommend them for everyone. Can you spray these boots off with a hose? I walk around in manure all day and always spray my other boots off with a water hose at the end of the day. I say yes. I work on a slaughter floor all day and walk through the animal pens. I spray mine a lot. But when they are dry I try to at least once a month rub some conditioning oil stuff on them. And mine have lasted a year easily with lots of exposure to water and cleaner. Yes, they can be hosed off. I've walked in mud and had to hose them off. No problem! Biggest challenge is getting the mud out of the tread of the boot. But that's no different than any other boot with tread. I have never had to fully sprayed them off after being in the field, but they hold up well in water. Yep, you sure can! These boots are amazing! I understand that it will vary dependant on work intensity, but, what is the life expectancy of this boot? BEST ANSWER: I’ve had them for 3 years and their still great! Does anyone know if there is a significant weight difference in the safety toe vs. non safety toe boot? BEST ANSWER: No!!! They feel the same weight. Maybe a little tighter in the toe- but super lightweight and comfy! They are pretty snug in the steel toe area... the tip of my toe to the front has enough room but above my toes is pretty tight, will this loosen up or do I need to go up a size? BEST ANSWER: The steel toe those rub into my pinky toe area throughout the day, unfortunately there isn't a fix unless they expand that steel corner a bit more. Nothing a bandaid won't fix. Mine fit comfortably but I am aware that I can't wear the thickest wool socks that I have. What is the shaft opening dimensions of a size 9.0? BEST ANSWER: It is 15" around. Is this men size or women size? BEST ANSWER: This style is only offered in women's sizes, we recommend selecting your usual women's size. Do these also come with ankle frauds ? Like on the men's version ? BEST ANSWER: We apologize, we are not sure what you mean by ankle fraud. You may be referring to the heel guard on Style CMP1200. If so, this style does not feature a heel guard like on the men's Style CMP1200. If this is not what you are referring to or if you have any additional questions please feel free to contact us at 800-833-3118 for further assistance. What is the size of the leg opening on a size 8-8.5? BEST ANSWER: Measured around the outside, it is approximately 14" around. 6 inches from front to back. A little tight in the ankles, and takes some time to break into. Are these boots warm enough to wear in the snow, cold? BEST ANSWER: This is not an insulated boot. BEST ANSWER: I live and work outdoors in northern Canada. I bought mine as summer boots, which they are great for, but with our extreme cold I would not try them in winter. Being waterproof, they will take me through the fall and mild winter days, but if it's dropping down to -20 or colder where you are, I'd recommend investing in some insulated boots. I live in siuth florida and I find these boots to be hot but it is worth the trade off. I have had these boots for several months now and I find myself wanting to wear them even when not working. They are more comfortable than my tennis shoes. I love these boots. Yes. I have two pairs. Wore them last two winters on the farm. We had over 24 inches of snow both years which I trudged through for hours. Kept feet toasty and dry with regular cotton socks. Yes!! So warm and great traction!! What is the weight for a pair of this style in a size 8? BEST ANSWER: The weight for this style in a size 8 is about 4lbs. BEST ANSWER: Our boots use industry standard sizing and are thus true to size. Yes, they are true to size. I buy a half size bigger than my normal street shoes to allow for a little extra room and/or thicker socks. I just bought my second pair, and I love them! Well I really don't know cause I brought it for someone. Sorry I can't answer the question. I would go a half-size larger. Mine were a little tight and gave me bad blisters. Yes, they are true to size. I love mine! Are these boots oil/slip resistant? BEST ANSWER: This style does offer slip resistance. Yes they are. They have a nice thick treaded rubber out sole. They also fit true to size and are very comfortable, no break in required. I teach welding at a high school and am always on my feet. I've also worn these out in wet weather and snow and have stayed dry and warm. In the summer my feet are not hot or sweaty in them either. Hands down these are my favorite steel toe work boots to date, and when these wear out I will be buying these same boots again. As a bonus they just look great too. what are the dimensions of the shaft? BEST ANSWER: We are happy to provide the dimensions, however it varies by size. Please contact us with the size you are interested in for further assistance. You can reach us by phone at 800-833-3118 Monday-Friday from 8am-8pm EST, by Live Chat Monday-Friday 9am-11pm or Saturday & Sunday 9am-8pm EST or anytime by email at just_ask_us@carhartt.com. what is the best way to clean them in order to maintain the waterproof feature of this boot? my daughter works constructions and its snowing now can she wear these boots in winter. Is this boot CSA rated and electrical construction rated? BEST ANSWER: This style is not CSA rated, however it is ASTM 2413-11 EH rated. are these boots steel toe? BEST ANSWER: Yes, our Style CWP1250 is a steel toe boot. Yes, steel toe is required by my employer. I love these boots!